This can be used to a million things I will let you know for what and how to use this. I like to use it in my diffuser when I’m feel stressed or over whelmed with life. So here is some things it can be used for . Immune System: Frankincense Oil is effective as an antiseptic, and even the fumes or smoke obtained from burning it have antiseptic and disinfectant qualities that eliminate the germs in the space where the smoke filters out. It can be applied on wounds without any known side effects to protect them from tetanus and becoming septic. It is equally good on internal wounds and protects them from developing infections. Oral Health: Those same antiseptic qualities also make frankincense oil a useful preventative measure against oral issues, like bad breath, toothaches, cavities, mouth sores, and other infections. Look for natural oral care products that include frankincense oil if you enjoy the flavor or aroma, and want to include a strong antiseptic in your health regimen. You can even create your own all-natural toothpaste with frankincense oil and baking soda, or a mouthwash with water and peppermint oil. Astringent: The astringent property of Frankincense Oil has many benefits, because it strengthens gums, hairroots, tones and lifts skin, contracts muscles, intestines and blood vessels, and thereby gives protection from premature losses of teeth and hair. This astringent quality also reduces the appearance of wrinkles, and combats the loss of firmness of intestines, abdominal muscles, and limbs associated with age. Above all, frankincense acts as a coagulant, helping to stop bleeding from wounds and cuts. This astringent property also helps to relieve diarrhea of various types. Emenagogue: Frankincense essential oil reduces obstructed and delayed menstruation and delays the advent of menopause. It also helps curing other symptoms associated with menses and Post Menstrual Syndrome, such as pain in the abdominal region, nausea, headache, fatigue, and mood swings. Carminative:Frankincense oil eliminates gas and prevents it from building up in the body. This removal of excess gas from the intestines also gives relief from associated problems like stomach aches, pain in the abdominal region and chest, abnormal amounts of sweating, uneasiness, indigestion and many other related conditions. Cicatrisant: This is an interesting property of Frankincense Oil, and since skin health and anti-aging are such hot topics these days, this essential oil has become even more important! When applied topically or inhaled, it can makes the scars and after marks of boils, acne and pox on the skin fade at a much faster rate. This also includes the fading of stretch marks, surgery marks, and fat cracks associated with pregnancy and delivery of children. Digestive: Suffering from indigestion due to that turkey last night? A patient of chronic indigestion and acidity? Fed up with those antacids? Then you should try Frankincense Oil instead. This oil has digestive properties without any side effects, and it facilitates digestion the way most medicines should, unlike common antacids which only suppress the symptoms. This oil speeds up the secretion of digestive juices (gastric juices, bile and acids) in the stomach and facilitates movement offood through the intestines by stimulating peristaltic motion. This means an all-around improvement in the digestion of food. Anti-Aging: As a Cytophylactic, Frankincense Oil promotes regeneration of healthy cells and also keeps the existing cells and tissues healthy. When you combine this aspect of frankincense oil with its powerful astringent capabilities, you have a potent anti-aging quality that frankincense oil is often used for. It can help you to eliminate sun spots, remove micro-wrinkles around the eyes and cheeks, and generally tone and tighten skin all over your body, while simultaneously replacing old or dying cells with new, healthy ones! Tonic: Overall, frankincense essential oil tones and boosts health and is therefore considered a tonic. It benefits all the systems operating in the body, including the respiratory, digestive, nervous, and excretory systems, while also increasing strength by aiding the absorption of nutrients into the body. Furthermore, frankincense oil strengthens the immune system and keeps you strong and protected for the future. Diuretic: If you thought that Lasix and its variants were the only drugs that could help you release water from the body through urination, you were incorrect. Those pharmaceutical options may be instantaneous, but not very safe. 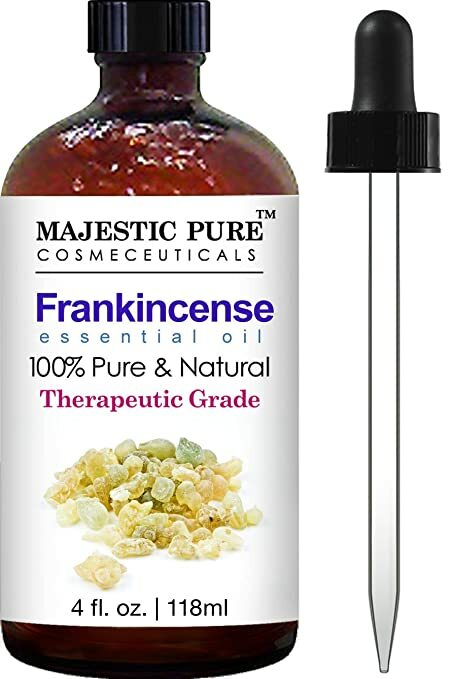 Frankincense essential oil is a natural and safe alternative. It promotes urination and helps you lose that extra water weight, as well as fats, sodium, uric acid and various other toxins from the body, with the added advantage of lowering blood pressure. The best part about this is that frankincense essential oil is completely safe and has no adverse side effects. Respiratory Issues: It soothes coughs and eliminates phlegm deposited in the respiratory tracts and the lungs. Frankincense essential oil also provides relief from bronchitis and congestion of nasal tract, larynx, pharynx, bronchi, and lungs. Its antidepressant and anti-inflammatory properties also help relax the breathing passages, which can reduce the dangers of asthma attacks, and its antiseptic qualities are what give it the reputation of being an immune system booster! It also eases body pain, headaches, toothaches and balances the rise in body temperature commonly associated with colds. Stress andAnxiety: Frankincense Oil is very effective as a sedative, because it induces a feeling of mental peace, relaxation, satisfaction and spirituality. It also awakens insight, makes you more introspective and lowers anxiety, anger and stress. When feeling anxious or if you anticipate some sort of stressful episode, add some frankincense oil to a diffuser or a vaporizer. Frankincense essential oil promotes deep breathing and relaxation, which can open your breathing passages and reduce blood pressure, moving your mental state back to calmness. Uterine: This oil is very good for uterine health. Since it regulates the production of the estrogen hormone, it reduces the chances of post-menopause tumor or cyst formation in the uterus, also known as uterine cancer. In terms of the pre-menopause period, it keeps a woman’s uterus healthy by regulating proper menstrual cycles. It also treats or regulates gynecologic conditions or stressors that can lead to complicated dysfunctions in certain women. Vulnerary: Simply apply a diluted solution of this oil on wounds, or use it blended with a skin cream, and your wounds will heal faster and be protected from infections. This oil is equally beneficial in healing internal wounds, cuts and ulcers. Other Benefits: It relieves pain associated with rheumatism and arthritis. It helps heal boils, infected wounds, acne, circulatory problems, insomnia and various types of inflammation. Remove moles, skin tags, and warts. Apply a single drop 3 or 4 times a day until gone. Note that if the mole is dark and ragged around the edges and/or growing quickly, see your healthcare professional for an assessment and possible treatment. Remove musty odors. Place a couple of drops in a small dish of water and the room will take on a much fresher smell. So here are just a few of the things that it Frankincense can do so PLEASE CONSULT A DOCTOR BEFORE USE.